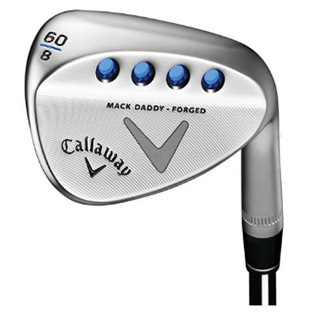 I recently tested the Callaway Mack Daddy Forged R Grind Wedge in two loft/bounce combinations: the 60 degree with 8 degrees of bounce, and the 56 degree with 8 degrees of bounce. Setup: This club sets up just perfect at address, allowing the player to add or decrease loft. Off hardpan lies the club allows the player to use the bounce setting up just right. In the rough, the club is the same way allowing the player to cut right through the rough. You can setup the club forward in the stance or in the back of the stance without losing the workability of the club. Pitch shots: The wedge is great for pitch shots allowing the player to hit bump and runs releasing to the hole. Depending on the skill level (the reviewer is a lower handicap), this club is great for hitting little check shots on the fly, and has great feel when hitting one-bounce-and-stop shots. The club still feels great when wanting to hit on the toe to reduce pop or power. The club has great grooves that are not deep in any sense, but just right to hit full shots while allowing for spin. Out of the rough: This club allows for the player to produce different kinds of shots. The R grind is great out of rough making it easy for the player to get right out of the rough. Put the club back in the stance and the ball can still come out nice, but still can produce low flighted shots with a decent amount of spin. The club can produce a lot of spin even out of thick lies. Playing shots out of thick rough isn’t so bad, allowing for different types of shots. Bunker shots: The 60 degree is great for all shots wanting to be played. Simply put it in the back of the stance or just hinge the club closed a tad if needing to play long bunker shot. If needed to come out high and soft it will do just that. The club has great grooves allowing for tremendous spin out of the bunker. The club seems to pop up the ball with little to no forced effort. Setup: The club sets up very nice at address, allowing for small amounts of loft adjustments needed for the shot. Doesn’t open or close as much as the 60 degree, although that’s not something a 56 should do as much as a lob wedge. Still can have worked shots using different amounts of lofts. The 10 degrees of bounce on this club is just perfect for a 56 degree. It’s such a versatile amount of bounce allowing for types of shots just by little kinks at address. Pitch shots: This club is perfect for bump-and-runs or low flighted shots around the green. It's perfect for pitching into the fringe while still allowing for workability and different amounts of spin needed for the shot. The club isn’t as great for high flighted shots, but that’s what the 60 degree is for in my opinion. The club can be used for low spinners or also a mid-flighted chip with spin, or even a mid-flighted shot with no spin. Out of the rough: The club is great out of the rough. It can come out low with spin. 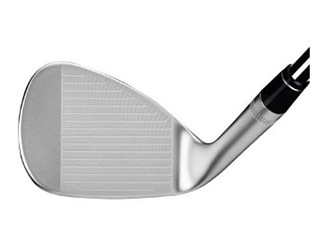 The player does not need to worry about hacking it out, as the club has the perfect amount of loft and grind. The club still produces a decent amount of spin, although not as much as the 60 degree. Personally, around the greens I feel more comfortable with the 60 degree out of the rough. On the other hand, I still use this club if there is a reasonable amount of green to work with or a shot needed to run up to the hole. I feel great and much more at ease knowing it will release and run up to a desirable distance. Bunker shots: The sand wedge is what most golfers call their 56. It’s just that, it is great out of the bunkers. Still allowing for higher ball flight to carry that dreaded lip, but also perfect for longer bunker shots needed to carry further distances more controllably. This is the versatile sand wedge just as the 60 degree. They are two great clubs that make you really think about which club to use. It’s great that these clubs provide options, something great in golf. 60-110 yds: The club is great when needed to just barely carry a bunker and spin or bounce up and check. The golfer can create many different shots with this club. The club has the perfect amount of spin for these kinds of shots. It has just enough to control it without sometimes getting lots of spin or the ball releasing off the green in turn producing a frustrated golfer missing the green with a wedge. This club takes a lot of that card out of play. These two clubs have potential, for many kinds of shots on the different courses with different grass and conditions. The clubs just complement each other so well. The perfect set up for great short game and shots within 100 yards. The word used a lot in this review was “allow” because it’s the perfect word to describe the wedges. It does just that, “allow” for so many shots. These clubs are great for serious golfers wanting to produce a multitude of shots, but can also be great for just the average golfer.